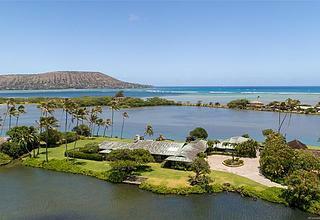 Welcome to “Hale Aloha”, JIM NABORS’ Diamond Head Beachfront Estate, located two doors down from the Doris Duke Estate. Both personalities could have chosen any location in the world to own a home, but they decided to settle in this iconic and most sought after location. Features over half an acre of land with 170 linear feet of ocean frontage and incredible panoramic views. This treasured home of the famed entertainer, who was also one of Hawaii’s beloved residents, exudes an ambiance of Old Hawaii with an open layout offering refreshing breezes throughout and indoor-outdoor spaces ideal for the island lifestyle. The two-story home was built in 1950 and extensively renovated in 1996, retaining its character as a “plantation style home of lava stone and board-and-batten construction” as described in an Island Home Magazine article published in December 1993. A serene garden setting invites you into the property with lush landscaping and Koi ponds along a stone path leading to the front door. Sweeping ocean views take your breath away as you enter the foyer, which flows to the living room with floor-to-ceiling sliding doors opening to a wide covered ocean view lanai and crowned with a stunning “Baccarat crystal chandelier that once graced the palace of Napoleon Bonaparte in Paris”, according to the article. Step into the crystal clear waters of a favorite local swimming spot (Cromwell’s) from the spacious enclosed oceanfront yard via your private ocean access gate. Entertain family & guests poolside in the cabana with wet bar under the swaying palms while enjoying the expansive ocean views. Private 1-bedroom/1-bath guest quarters is conveniently located on the first floor adjacent to the pool area. Courtesy of Patricia Choi, Hawaii Life Real Est Services. 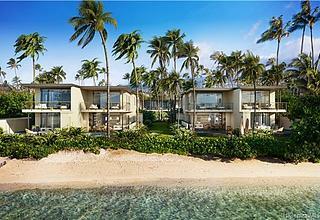 I found this listing at 215 Kulamanu Place in Honolulu and would like more information. Thank you.